F.H.L. Dental (Spring Valley) - Book Appointment Online! 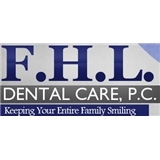 If you're looking for a family dentist that will make time for your appointment on fairly short notice, and spend the time explaining preventive measures and restorative dental procedures, F.H.L. Dental Care, P.C. is the dental clinic for you. Dr. Juan Espaillat is fluent in both English and Spanish to make sure he can accommodate any patient in the comfort of their own language. Dr. Espaillat is great. My only complaint is having to wait over an HOUR to be seen.